With the explosion in popularity of comics and graphic novels (not to mention the many books and films based on them), budding authors and artists are eager to break into the market. While talented people have more opportunities today to get their work published than ever before, it still can be a daunting prospect to figure out out to translate ideas into a finished product, not to mention how to get it published and publicized. 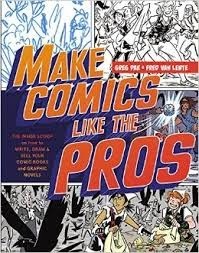 Two established comic authors, Greg Pak and Fred Van Lente have gotten together to give advice to all the up and coming artists in Make Comics Like the Pros: The Inside Scoop on How to Write, Draw, and Sell Your Comic Books and Graphic Novels. The most difficult thing for a prospective artist to accept might be the idea of collaboration, which the authors insist is vital to the success of any graphic novel project. They have been successful writing both as individuals and as a duo, and both agree that the give and take of collaboration has made them better writers. They even have an illustration of a page from one of their books showing the edits that each made to it. Of course, it likely helps if you respect the judgement of your collaboration partner! Using an example comic called "Swordmaids" the authors take us through the steps in creating the script and visuals, then on through how to pitch your idea, estimate profit and loss and find an audience. They give very detailed information about each step, starting with how to create a "comics script template" using Microsoft Word. There is also practical advice for creating the visual aspects of the work, including putting the most important things in each scene in front and progressing the action from left to right. The various jobs of the people who work on the basic outlines are also explained. These include the Inker, the Colorist, the Letterer and the Editor, as well as "commandments" for each job -- so it becomes obvious why the authors stress the importance of collaboration and communication! Anyone who is interested in getting into the comic or graphic novel business could learn a lot from this book. They certainly don't make the process look easy, but this detailed advice will help aspiring artists and authors get on the track to success!